Many ADHD Students have significant deficits in social skills - particularly those that are impulsive or hyperactive. Often ADHD students are seen as being too loud, too pushy, even obnoxious. But it doesn’t have to be that way. We can help them to be more successful. Students with attentional problems experience many difficulties in the social area, especially with peer relationships. They tend to experience great difficulty picking up other’s social cues, act impulsively, have limited self awareness of their effect on others, display delayed role taking ability, and over personalize other’s actions as being criticism, and tend not to recognize positive feedback. They tend to play better with younger or older children when their roles are clearly defined. These students tend to repeat self defeating social behavior patterns and not learn from experience. Conversationally, they may ramble and say embarrassing things to peers. Areas and time periods with less structure and less supervision, such as the playground and class parties, can be especially problematic. Provide a safe environment for the child. Make sure the child knows you are his friend and you are there to help him. Treat him with respect. Never belittle him in front of his peers. Both he and the other children know that he stands out, and if the teacher belittles the child, then the rest of the children will see that as permission from the teacher to belittle the child as well. Enlisting the support of peers in the classroom can greatly enhance your student’s self esteem. Students with good social awareness and who like to be helpful can be paired with him. This pairing can take the form of being a “study buddy”, doing activities/projects, or playing on the playground. Cross age tutoring with older or younger students can also have social benefits. Most successful pairing is done with adequate preparation of the paired student, planning meetings with the pair to set expectations, and with parental permission. Pairing expectations and time commitments should be fairly limited in scope to increase the opportunity for success and lessen the constraints on the paired students. Students with attentional problems tend to do well in the cooperative group instructional format. 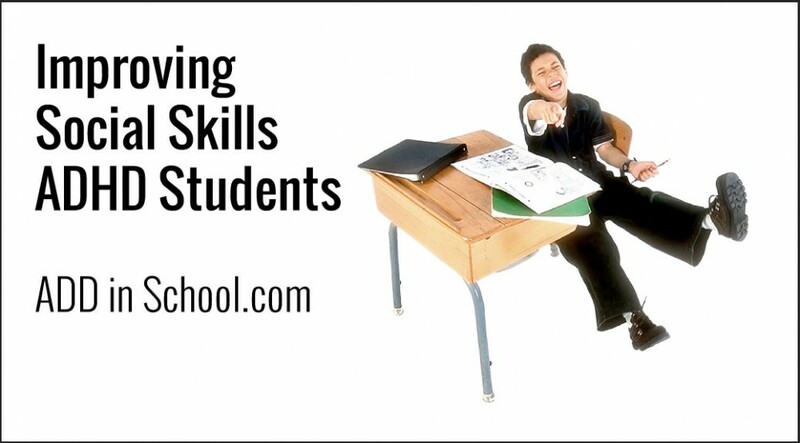 Small student groupings of three to five members, in which the students “sink or swim” together to complete assignments/projects, encourage students to share organizational ideas and responsibilities, and gives an ideal setting for processing interpersonal skills on a regular basis. Small “play groups” of two to four students can help your student to develop more effective social skills. These groups are most effective if socially competent peers are willingly included in the group. The group should be focused on activities that stress interaction and cooperation. Board games, building projects, and sessions that promote frequent verbal interactions provide the greatest opportunity for learning appropriate social skills and controlling impulsivity. Your student would benefit most when the target social skills are identified and practiced with them prior to the activity and processed after the activity. Many students lack friends to be with outside of the school setting. It can be beneficial to strategize with your student and his parent on developing a “friendship plan” for the home setting. Sometimes the goal of establishing one special friendship is ambitious and sufficient. This could include steps of identifying friend possibilities that might be available/accepting, practice in making arrangements using the phone, planning an activity or sleep over that is structured/predictable, and tips on how to maintain friendships over time. A subtle way for your student to learn social skills is through the use of guided observation of his peers on the playground. Accompany them on to the playground and point out the way other students initiate activities, cooperate in a game, respond to rejection, deal with being alone, etc. For many students, thirty minutes on the playground is beyond their capability to maintain peer relationships successfully. If necessary, break up the recess into ten minutes of activity, a ten minute check in with the teacher/playground supervisor, then another ten minute activity period. Restricting the area available for your student during recess can increase the contact with adult supervision and lessen the complexity of social decision making. This can be done privately with your student prior to recess. Many students welcome this manner of simplifying their social interactions during this period of low structure. It is helpful to meet with your student prior to his lunchroom/playground period to review his plan for recess activity and with whom he will sit during lunch. Have him ask peers in advance of the recess block to do a certain activity with him. Process the activity with your student after recess and make suggestions for the following day.